In a large bowl mix the apple juice, tamari, agave, water, and garlic. 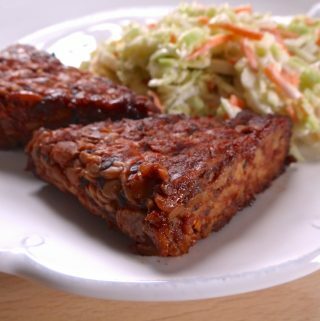 Place the tempeh into a baking dish in a single layer and pour the mixture over the tempeh. Drain the tempeh and let cool for a few minutes. Place baked tempeh into a frying pan on the stove top at medium low heat. Brush each side and all the edges with BBQ sauce. Turn over periodically. Remove from heat when lightly browned. Serve with vegan cole slaw, quiona and corn, or use in a sandwich. Store leftovers in the fridge for up to one week.